A chair may be the most important piece of office furniture you buy. You depend on it to keep you comfortable as you spend many long hours working at your desk. You also want a chair that will add a touch of style and prestige to your office. Our collection of handsome solid wood Amish Desk Chairs features sturdy pieces that are designed with comfort in mind. With so many attractive styles to choose from, you can count on your chair to enhance your office décor. If you spend a great deal of time behind your desk, you need a chair that can hold up well and stand the test of time. 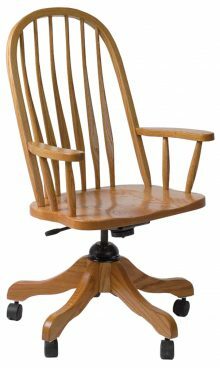 Our chairs are made from your choice of durable hardwoods such as oak, cherry and maple — not flimsy particle board or fragile pressboard. Our chairs are also never mass-produced. They’re individually handcrafted by expert Amish artisans who pay attention to the smallest of details. You’ll always get a great deal on office furniture at AmishOutletStore.com. You’ll receive up to 33% off the regular retail price of any chair in our collection if you place your order today. You can also get up to an additional 13% off by adding other office furnishings such as desks, bookcases, computer centers or file cabinets to maximize the large order discount. 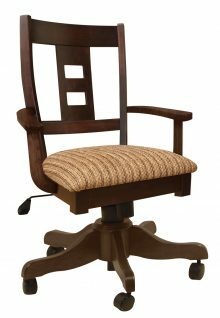 Browse our collection of solid wood Amish Desk Chairs and order one for your office today! Amish furniture is known for its timeless style and expert craftsmanship. 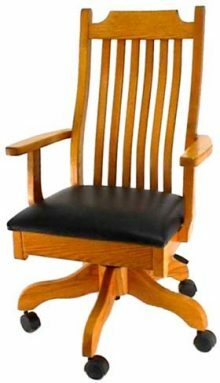 While these characteristics may seem out-of-step with the modern office environment, an Amish desk chair remains an excellent addition to any home or business. Your choice of solid wood Amish furniture is one that, if properly cared for, will last a lifetime. Choose Amish furniture for anywhere you require a comfortable, durable chair to sit and work in. Follow the links on this page to learn more about our build process and our inventory. You want your employees to feel comfortable. The more comfortable they feel, the better they can concentrate on their work, and the happier they will be. Buying your employees Amish desk chairs that provide the right amount of support as they work offers a fantastic way to show the people at your company what they mean to you and how much you value their contributions. We have bulk purchasing options for businesses. Imagine all your employees in the same chairs, bringing an orderly, uniform look to your business that creates a memorable first impression on prospective clients. When you buy chairs from us, you can also check out our desks, bookcases, credenzas and other office furniture that will continue with the polished appearance you want your office to convey. Our artisans use the finest materials to construct each chair. Your employees will appreciate that attention to detail during the hours they spend at their desks. 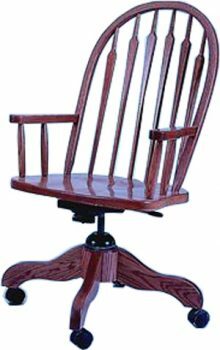 AmishOutletStore.com features solid wood desk chairs in a range of styles and configurations. While we don’t carry typical plastic or vinyl office chairs, we offer products of a far superior quality, with classic styling that will blend in with any décor. 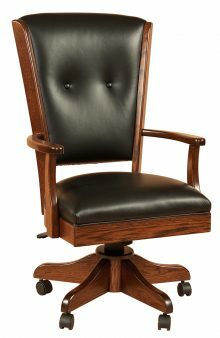 For a more traditional office, consider our Berkshire or Starr chair designs. For an office with a more contemporary sensibility, a Mission-style desk chair or Clark executive chair provides a nice contrast to clean lines of glass and chrome. We also carry stationary chairs for use in waiting rooms, side chairs, paddle back chairs and more. 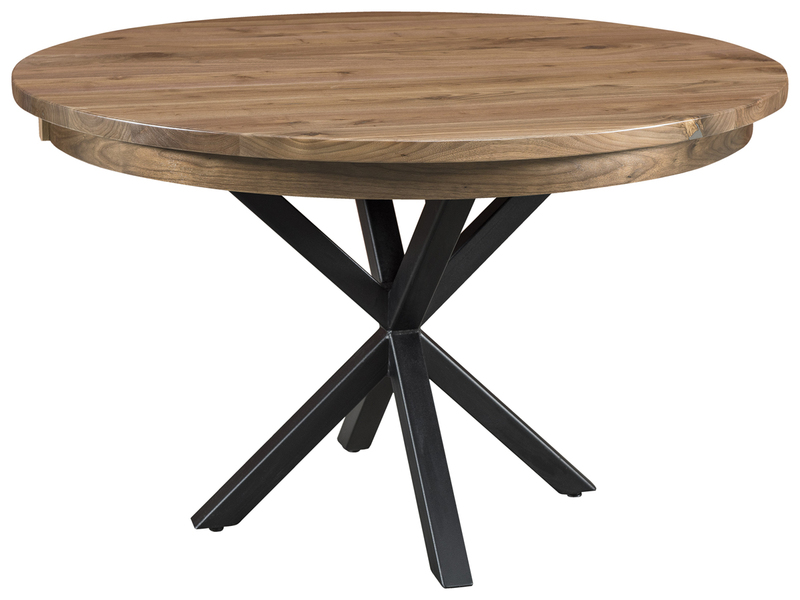 Our products are available in multiple wood, stain and upholstery configurations. Follow the links below to explore our current inventory! Solid wood desk chairs don’t have the full range of positioning options that some modern ergonomic chairs do — as such, it’s important to choose a chair you’ll be comfortable in. A chair’s seat height should allow you to plant your feet firmly on the floor, while the backrest should extend up at least half the length of your back, or longer if you require additional support. Other things to think about include whether or not you need armrests, whether you prefer leather or fabric upholstery and which color and type of wood you prefer. While these are largely personal preferences, feel free to contact AmishOutletStore.com to speak with a representative about your options. Our Amish office desk chairs offer exceptional durability against everyday wear and tear. Unlike most disposable office chairs, we’ve designed and built our products to a standard of quality that can last a lifetime. Clean and polish your chair regularly. Avoid the use of harsh chemical cleaners — instead, seek out natural, organic or DIY alternatives. Maintain a steady temperature and humidity in your office to prevent the wood from warping. Consider investing in a dehumidifier if you live or work in a property prone to dramatic seasonal fluctuations. Avoid long-term exposure to light, which can cause fading. When not at work, keep your blinds shut and turn the lights off. You can find more tips and tricks for maintaining an Amish office desk chair here. Invest in Quality Furniture Today! 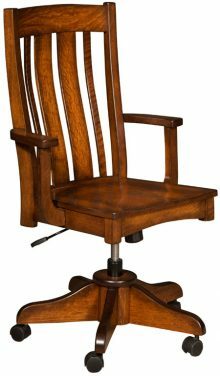 All our Amish desk chairs are crafted in the USA using furniture-making techniques that have been passed down for generations. If you’re looking for the perfect chair for your office, choose quality that has stood the test of time. 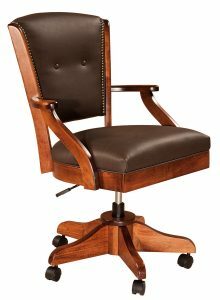 Browse our full selection of solid wood desk chairs online, or contact our team directly for assistance.